While recording facts from my grandfather's Italian hometown's vital records, I noticed more than one extremely young person getting married. Often a young girl who was orphaned would be married with her grandfather's permission as a matter of survival. Her new husband could take care of her. While revisiting some of these documents I found some young people who needed a royal decree before they could marry in 1818. One was Michele Franco, a 16-year-old farmer who was about to marry a 19-year-old seamstress. They lived in different towns, so perhaps this was not an arranged marriage, but a marriage for love. It's hard to imagine why else a 16-year-old boy from another town would be a suitable choice for this 19-year-old seamstress. 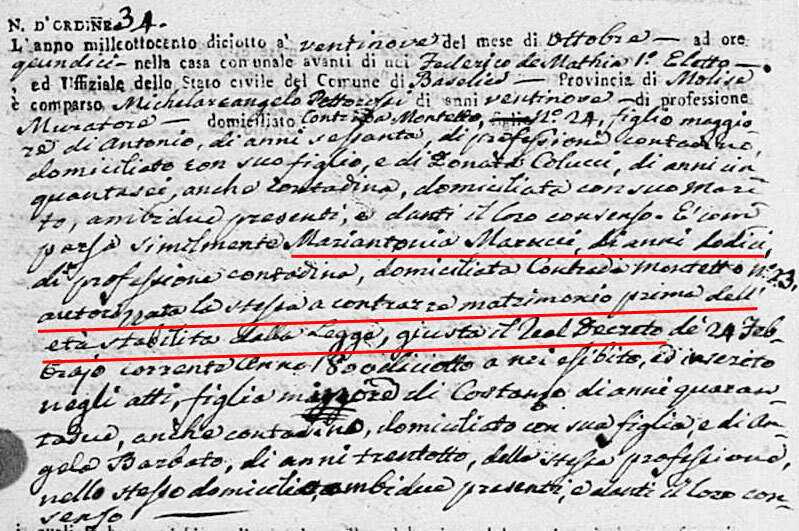 Because of his age, Michele received a royal decree on 18 August 1818 granting him permission to marry. Another, somewhat astonishing case is 12-year-old Mariantonia Marucci. She was not an orphan and had her parents' consent to marry 29-year-old Michelarcangelo Pettorossi, a bricklayer. The couple had 10 children together starting when Mariantonia was the ripe old age of 15. Mariantonia received a royal decree on 24 February 1818 granting her permission to marry despite her lack of age. I have no details about Mariantonia's parents, but maybe they were so impoverished that this was the only way they could provide a decent life for Mariantonia. Then there was 14-year-old Angelamaria Silvestro, who became an orphan at the age of 10. Her grandfather was quite old when he gave her his consent to marry 29-year-old Serafino Verdura, a farmer. Angelamaria did not appear to need a royal decree which makes me wonder when and why such a court order was required. You can understand the 12-year-old girl needing special permission, but why did the 16-year-old boy need it when the 14-year-old orphan girl did not? Some research about the age of consent to marry in the 19th century seemed to indicate that it was perfectly fine for a 12-year-old girl to marry. It is possible that this particular area, or perhaps all of what was then the Kingdom of Two Sicilies, had their own age of consent rules. In the early 1800s in the small Italian towns I've research, the average age at first marriage was about 25, so parents were not marrying off their children unless they really had to. It's interesting to compare these two very young girls to modern-day Italians who must be 18 to marry—or 16 with court consent.